We carry the complete selection of Jelly Belly Beans. Rarely do you find a candy store with more than 12 flavors. At Kali's we carry all the bean flavors - way beyond the 50 flavors most people know about! Our store carries all the rookie flavors, the BeanBoozled flavors (grass, vomit and other disgusting flavors to fool your friends) and several different assortments including the Soda Pop Shoppe Flavors. 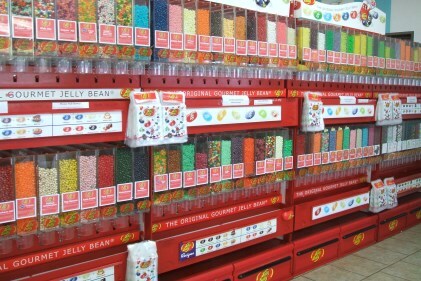 Many first-time customers are surprised to see the amount of Jelly Belly souvenirs we carry. All of this and Sport Beans too! Jelly Belly Sport Beans have been growing in popularity since their inception. These are specially formulated to give athletes the nutrition they need when they need it most. And, they taste great, too! We often have Mr. Jelly Belly out in front of our store waving at traffic - stop in an see what's he's so excited about!